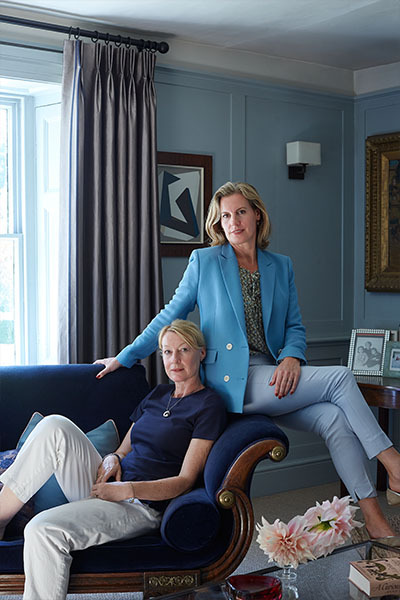 Vero Fabrics Ltd was established by Ottilie Stevenson and Amanda Purves after many years of working together at Vanners. They both bring different areas of expertise to the business and share a love of design and manufacturing. Ottilie brings a wealth of design experience as the Creative Director of Vero Fabrics. She has a real passion for the hospitality sector and has developed a unique and versatile contract collection for Vero Fabrics. She has designed for Osborne & Little, Cole & Sons and Heals and is widely recognised in the industry for her love of colour and the border designs she continues to develop. Amanda as the Sales Director works closely with hospitality and residential clients to deliver projects in the UK, Europe & the US. Private commissions are very much a part of what we do and one of the areas we both enjoy being involved in. Vero Fabrics specialises in the production of luxurious seamless borders woven to order in England. This concept eliminates the need for an extra process of sewing a border onto the bottom of the fabric or down the leading edge. We are also able to offer an in-house design service as well as bespoke colouring. Vero Fabrics exclusively distributes Ottilie’s designs for Vanners Furnishings which range from bold geometrics to exquisite, delicate plains in a wide mix of beautiful colours and yarns. Vero Fabrics works closely with its suppliers to deliver exceptonal textiles which are all woven and dyed in the UK. As a company, we strive at all times, to do the very best we can to deliver outstanding quality and dedicated customer service.